. 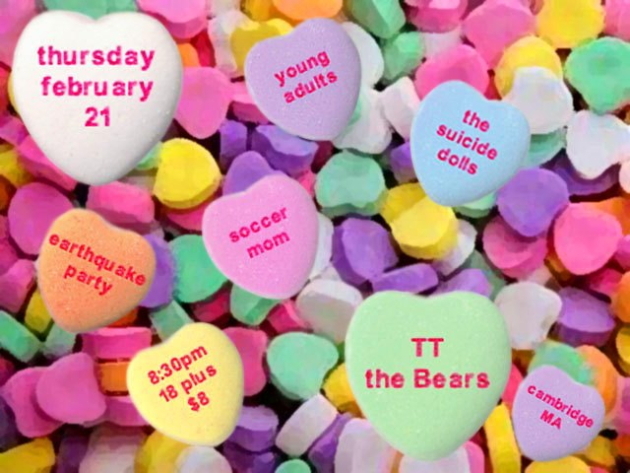 : Young Adults, Suicide Dolls, Earthquake Party, Soccer Mom | TT The Bear's Place, Cambridge | 21 Feb.
Young Adults, Suicide Dolls, Earthquake Party, Soccer Mom | TT The Bear's Place, Cambridge | 21 Feb. Stand up and be counted, for what you are about to receive. Gadzooks. It's gigs like this that make us wish we had our own gig rating system. But what would be the top rating? Would it be something empirically awesome like AC/DC's cannon blasts, which would sit atop a range of discrete things each less empirically awesome than the last? Or would it be an award of a number of the same empirically awesome thing, like one Van Halen flaming gong is worst but 10 Van Halen flaming gongs is the best? Clearly, we have a lot of thinking to do. But whatever that hottest rating would be, tomorrow night's show at TT The Bear's Place would absolutely warrant it. Don't let that innocent little flyer above with the candy hearts fool you: these bands are going to blow your face clean off your head, in the nicest way possible. First up are Clicky Clicky faves Soccer Mom, whose dense guitar assault and desperately delivered tunes make the quartet one of the most compelling bands in Boston. Earthquake Party and its convulsive, over-fizzed indie pop follow, and are in turn followed by Connecticut stoner-punk heroes The Suicide Dolls. Top-lining the bill and closing out the night are the Allston-spawned, reverb-eating indie punk titans Young Adults, who will be celebrating (and vending to willing purchasers) their stellar Born In '91 EP (which we wrote about here last week). In sum, this is an evening of rockutainment from which you may never recover. Ear plugs will likely not be enough; you may want to consider ear plugs as well as some sparring headgear to protect your dome whilst you headbang your life away. This will happen. You can thank us later. Now how about some songs? Review: Bettie Serveert | Oh, Mayem!